Greater Helsinki combines several fairly impressive characteristics: technological excellence, economic competitiveness, social equity and natural beauty. Nonetheless, in the near future the city of Helsinki and all of its 13 neighboring municipalities will have to face quite a few challenges. It will have to find ways to deal with increasing global competition, climate change, urban sprawl and traffic congestion, to name just a few of the obstacles on the road ahead. This requires all parties involved in the planning of the Helsinki Region to take action. 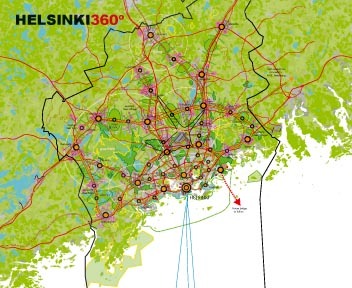 Helsinki 360 maps out a course of action.